We are potentially working on the project 'Our Traditions' which is an international project and giving opportunity to both countries (India and UK) talent to act this project. We start Hollywood acting school in Southall, so please contact us for enrolling. India film industry, the academy could be your best connection in London. We look forward to welcoming you to our next workshop! The Punjabi Theatre Adacemy (PTA) UK, is a Southall based theatre company, which has been serving the communities through performing arts for more than two decades. Following our successful productions such as Soni Mahiwal, Bebe Vilayat Wich, Puwara Bottle Da, Massacre Amritsar 1919, Lion of Punjab and our current production "Meri Woti Dey Nakrey" we are in the pre-production stage with our new grand project: "The Crownless King - Maharaj Dulip Singh"
Our vision is to present the prestige life events of the Maharaja including his journey to Briton, His relationship with Her Majesty, the Kohinoor and his untold attempted journey back to Punjab. 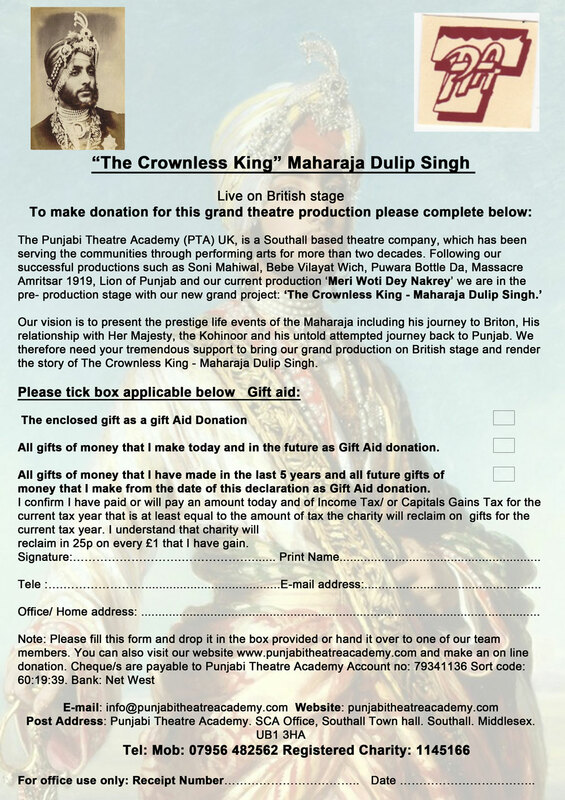 We therefore need your tremendous support to bring our grand production on British stage and render the story of the Crownless King - Maharaj Dulip Singh. To make donation for this grand theatre production click here or download flyer, fill it and send it to us.